For over six decades, Duramax has been developing product solutions for maintenance issues that allow ships to run more smoothly and efficiently. These products routinely blow the competition out of the water with impressive performance under the harshest conditions. In addition, the company provides excellent customer service which makes them a very dependable partner in this rapidly evolving industry. Deep Blue Yacht Supply offers the lowest pricing in the industry on all Johnson Duramax marine bearings, and can ship them efficiently across the globe. In the past, ships would break down quite often due to mechanical issues with the shaft and bearing systems. Duramax Marine has changed all that by elevating the standards of water lubricated bearings. The company injects millions of dollars into high-level research. The results of the studies are used to create rubber compounds that produce impressive performance in real world applications. Competitors have been left lagging behind. The most demanding clients, including the US Navy, choose Duramax products for the vast majority of their submarines and surface ships. This breakthrough product line is the marine industry's most favored water lubricated bearing. They have proven themselves to be reliable components in all kinds of vessels. Duramax Marine was the first to come up with cutless bearings through this line and it still stands as the only authentic product worthy of the label. Others have attempted to mimic the technology but all have come up short in terms of performance. One of the challenges with large shafts and propellers is that they often have to be removed during maintenance and installation of the bearings. However, Johnson Demountable Stave Bearings changes all that by providing an ingenious system that allows each piece to be installed or removed quickly and easily. This is of enormous benefit as the maintenance cost in both time and money is reduced significantly. These heavy nitrile rubber staves can be slid on perfectly fitting grooves so vibration is minimized. This prevents the shaft from wearing out and prolongs its service life. It is possible to have the staves custom-built for optimum alignment and fit. Duramax products can be found in many of the commercial vessels sailing today. Marine engineers depend on them to mitigate wear and tear which makes their job much easier. Any breakdown will cause costly shipment and travel delays so keeping things in top shape is always a priority. The company employs a team of professionals who have a deep understanding of what commercial fleets face on a daily basis. The team works tirelessly to improve the products and solve any new problem that comes along. Aside from research and development, they are also on hand to provide valuable support in times of need. If there is a maintenance issue that requires their technical expertise, the team will always be willing to give all-out assistance. The proprietary rubber formulation of Duramax Marine stays true to the company's name. It has demonstrated excellent durability time and time again. The nitrile rubber protects the shaft from damage which makes it superior to alternatives like hard surface bearings. With the business at stake, commercial ships prefer Duramax products every time. Recreational vessels range from personal watercrafts to large yachts. These can cost quite a sum and so the investment should be protected through proper care. That's why those in the know turn to Duramax Marine products for precision parts and exceptional services. 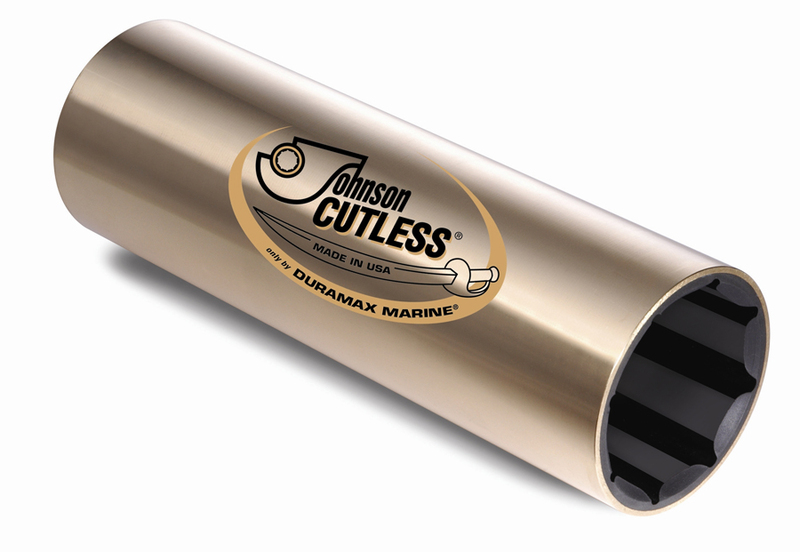 Johnson Cutless water-lubricated rubber bearings dominate in this segment with interior diameters ranging from 3/4" to 6-1/2". Customers can choose between naval brass and non-metallic sleeves. Round bore housings, meanwhile, will be best served by Johnson Demountable Stave Bearings which can fit shaft diameters of at least 2-1/2". Deep Blue Yacht Supply is the world-wide leader when it comes to supplying Johnson Durmax Marine bearings to yachts, boats, and pump installations. Deep Blue Yacht Supply offers the most competitive pricing in the world on all Duramax marine bearings.